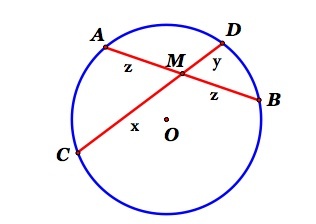 Consider a circle with chords AB and CD. Let the CD pass through the midpoint M of AB. Let AM = MB = z and let CM = x, MD = y. The lengths are all positive values. Construct the perpendiculars from center of the circle to the midpoints of the respective chords. 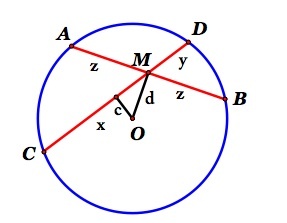 The distance to AB is d and the distance to CD is c.
Adapted from Sidney H. Kung, The College Mathematics Journal, Vol. 26, No. 1, Jan. 1995.